Trilogies are a staple of modern media, but not when it comes to Peter Molyneux's Fable. There's something about the number "3" that speaks to the human mind. Look it up, it's true. This might be why we create trilogies all the time, such as the Star Wars trilogies, the Mass Effect trilogy, the Lord of the Rings trilogy, and the Burger King videogame trilogy (soon to see a second?). Just in case you were wondering if Microsoft and Peter Molyneux's Fable III was going to mark the end of a trilogy of its own, it won't. Speaking to Inside Xbox at the Eurogamer Expo, Peter Molyneux revealed that the word "trilogy" isn't even in his vocabulary when it comes to Fable. "Forget about the word 'trilogy,'" he said. "I hate limiting ourselves to a trilogy." He even hinted that the ending of Fable III will lead right into the next game. "I want you to feel that you're on a journey in Fable, and I'm not going to tell you what happens at the end of Fable III, but I don't think you'll feel in any way that you've reached the end of a trilogy," he added. Years ago, Molyneux said he and his team had ideas for Fable all the way to a fifth game. His more recent comments emphasize that Fable will continue as long as both Molyneux and gamers can stand it. This is surely great news for anyone that loves farting on strangely dressed virtual companions. 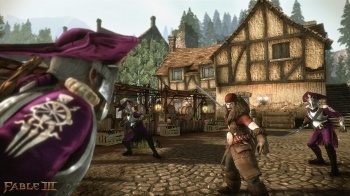 Fable III will be released on October 26.